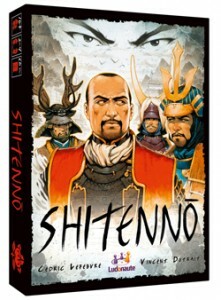 Recently, I reviewed Shitenno and mentioned I thought it would work well as a 2-player game. Since then, I had the chance to try this out and I’m pleased to say it does work well with 2 players as there are fewer combinations of cards and outcomes to try to consider so you can make a more informed decision. 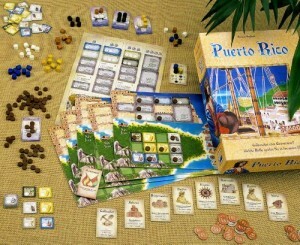 Rather than having to make one offer of cards at a time, with two players it is a simple one-player-splits-whilst-the-other-chooses process. Compared to the 4-player game, I found I could better work out which cards I wanted, plus I had more insight into which cards I didn’t want my opponent to have too. Even with this knowledge, creating a balanced offer of cards/role so that my opponent didn’t automatically take the offer I that really wanted still remained enjoyably difficult. 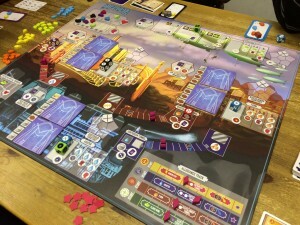 Also, selecting which role is offered with each group of cards is made more interesting because the person making the offer only uses 2 of the 4 roles each turn – in fact, I think I had more difficulty choosing which roles to offer than splitting the cards (in a good way as it was an interesting choice to make). The inherent downside to a directly competitive 2-player game is that what you lose the other player gains and vice versa (a kind of ‘tug-of’war’ play pattern), and you only need to watch a single opponent. 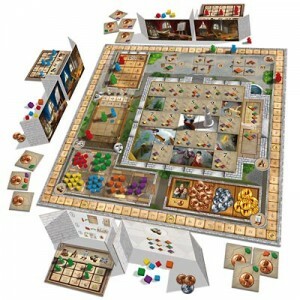 I was thinking that an invisible 3rd player would be good to make things a bit more ‘lumpy’ – I’ve noticed over the years, I like an invisible 3rd player in 2-player game (Alhambra was my first experience of it) but just so long as it is slightly predictable and not purely random. If it’s totally random, one player can suffer through no fault of their own just because they had no way to include the 3rd player’s actions into their plans, and this unbalances the game. 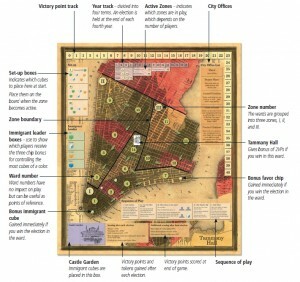 In Tammany Hall, players place their ward bosses to try to win the support of the migrant nation entering New York so that they will be voted in as mayor. There are 4 different migrant nations – each represented by different colour cubes (different to the player colours). In essence, Tammany Hall is an area control game but has some interesting elements that take it a bit further with hidden voting and role allocation. 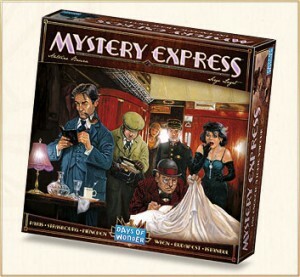 I liked the idea of an Orient Express themed deduction game. so was very open to trying Mystery Express. I’m not a fan of Clue/Cluedo as it’s too dry and massively dependent on dice rolls. The preview information released about Mystery Express indicated it was very different and had a lot more logic to it. During the game, you are trying to work out the 5 facts about the crime – where, who, what, why and when. Each turn, you have a fixed amount of time to spend on actions (based on which part of the journey you’re on, i.e. which turn) and each action is located in a different carriage of the train. Once you’ve been in a carriage, you can’t return to it during the same turn. Horus Heresy is FantasyFlight Game’s new version of the 1993 game set in the Warhammer 40k universe where the two players fight out the pivotal moment where Warmaster Horus turns traitor and tries to destroy the Emperor in an epic battle raging around the Imperial Palace and on the traitor’s flagship in orbit.